Jar (430g) rustica passata (Sainsbury’s) other supermarkets are available! Remove meat balls and place in the saucepan of tomato sauce, stir making sure the meat balls are cover by the sauce, reduce the heat a little and place a lid on the saucepan and simmer. Meanwhile cook some fresh pappardelle pasta to cooking instructions. 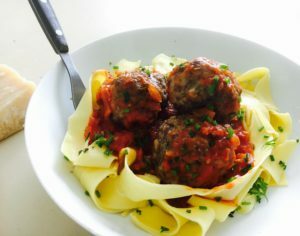 Add pasta to an open bowl and add the meat balls and sauce. Garnish with chopped parsley and chives and grate on some parmesan. Ooh yes!